And now as a mom, I was able to watch the same reactions in my children (twice!). There’s nothing like a Dr. Seuss book to transport you back in time to when times seemed a whole lot easier. Happy Birthday to You! Is no exception. From start to finish, I was smiling. Why? Because this book is a celebration of you! It’s YOUR birthday! It’s YOUR day! Celebrate YOU because YOU are what makes this world all that more better! It was an explosion of words that would make anyone feel like they were the most important person in the world on their birthday. The best cake, the best gifts, the best party…the best everything because it’s YOUR day! How could you not smile after reading this book? I am going to start a new tradition. I’m reading this book to my kids on their birthday…I don’t care how old they are…AND I’m going to read this book to my grandkids. The words and rhymes in Happy Birthday to You! will, no doubt, leave the birthday boy or girl feeling special beyond words. What I wished while reading Happy Birthday to You! was that someone was reading it to me. The best part of listening to a Dr. Seuss book was looking at the pictures while listening to the words. It made the world of Dr. Seuss all that more magical! I recommend Happy Birthday to You! 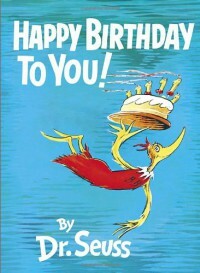 by Dr. Seuss to readers everywhere! I think it would be a wonderful addition to any birthday celebrations you may have. But I can’t only recommend one Dr. Seuss book! I encourage you to explore as many as you can, and get swept up in a world created for kids and for those of us who are young at heart.